Olivia and I went upstairs and sat in the empty restaurant of the ANZ Hostel in Selcuk, next to the famous Ephesus ruin. Ephesus used to be an important and wealthy Roman city mentioned in the Bible in Acts 19 with a detailed account of how Paul’s companions where taken by rioters into the theatre, who shouted, “Great is Artemis of the Ephesians!” More than two-thousand years later, when we stood at the same spot, I felt my heart beating fast as I pictured 25,000 people standing inside the amphitheater shouting at Paul’s companions who stood in the front. 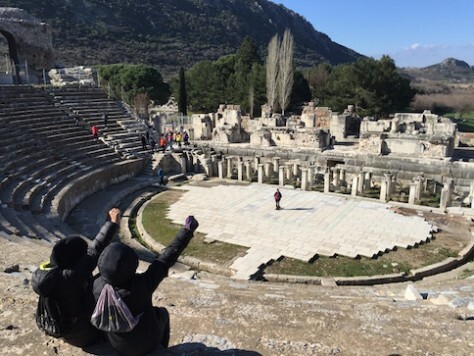 We re-enacted the scene in Acts when Paul’s companions had to withstand chanting protests from 25,000 mobs at the front of the theatre at Ephesus. “Yes, that would be fun. 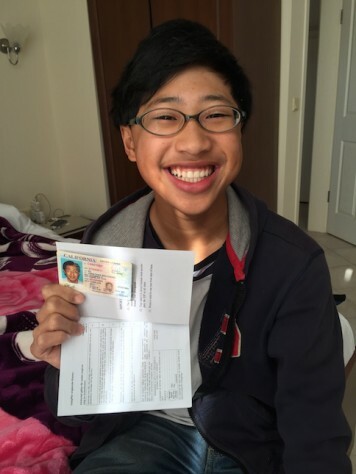 For Nathan, maybe we can do something related with driving since in the US, you can start to drive at 16…” I suggested. “What about answering questions from the driving test?” Olivia brainstormed. 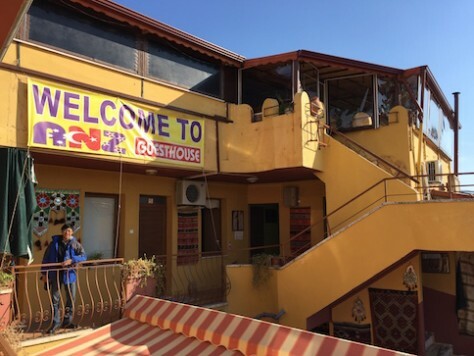 At Ephesus, we stayed at the ANZ hostel, where Olivia and I planned out the birthdays for Joani and Nathan. It was getting late that night, but after Olivia and I discussed for about 20 minutes, we had a rough outline of how to celebrate each of their birthdays from morning until evening. Thinking back, Olivia was more like a project manager who called the meeting, set up the meeting agenda, and took down minutes from the meeting. I was like a creative team member that gives suggestions and idea. At work, I have been a project manager for more than 14 years. It was nice to step back a bit and watch someone take over that role. I felt as if I was looking at myself as Olivia took the lead for this secret “Birthday Project”. “Will there be snow on my birthday?” Joani asked with a dreamy look few days before her birthday. 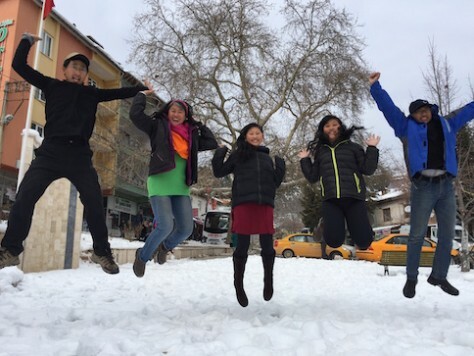 When we arrived in Istanbul, we were greeted by snow everywhere! Ever since we got off the plane at Istanbul, Turkey, Joani has been talking about having snow on her birthday, because the entire city of Istanbul was covered with 15 cm of fresh powder snow from the storm the night before. There was snow on the trees, snow on the cars, snow on the fences. As we walked one kilometer from the bus stop to our Couchsurfing host, we couldn’t resist to throw snow balls at each other. 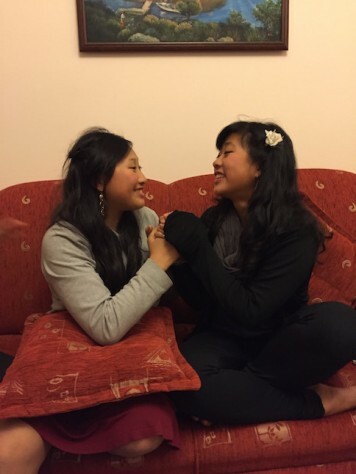 By the time we got to the couchsurfing apartment, our hairs were covered with snow flakes. Istanbul has a harmounious mix of Asian and European culture. 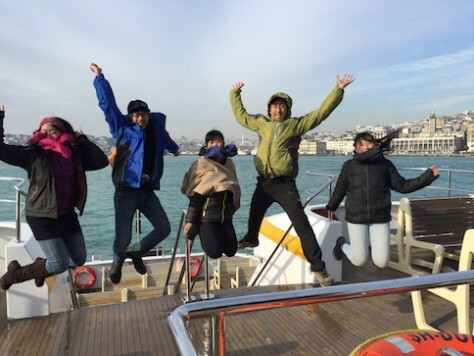 Crossing from the Asian side of Istanbul to the European side signifies that our travel has reached a new milestone. 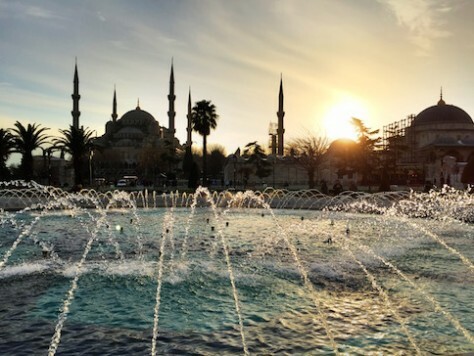 Sunset over the Blue Mosque at Istanbul. 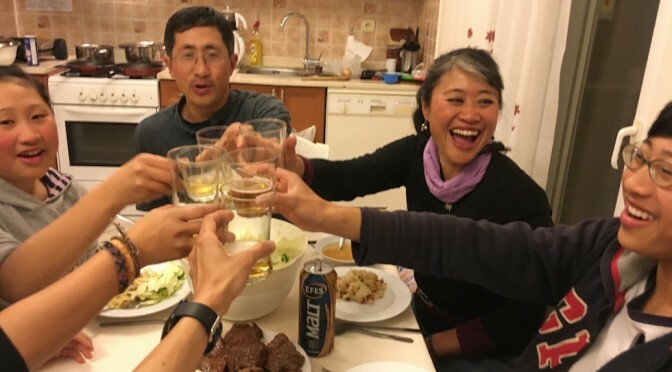 Our Couchsurfing host, Engin, lived on the Asian side of Istanbul, which is divided into European and Asian side by the Bosporus Strait. That afternoon when we took the sleek modern ferry from the Asian side to the European side, we couldn’t contain our excitement. 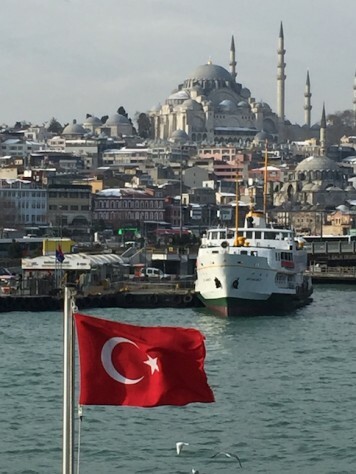 On one hand, the city view of Istanbul from the ferry with its harmonious mix of Eastern Islamic and Western stylish cultures was unlike any other cities we had visited so far. On the other hand, the crossing signified the new stage of our one year travel as we finally reached the continent of Europe after 7 months. We really enjoyed our stay at Istanbul because of Engin, the great generous and master of Jenga host we had there, the mother and son neighbors that took us in and fed us with delicious Turkish Cusine when we were stranded outside the door, the Syrian refugee couple who helped us to better understand the current crisis in Syria, and Annie’s high school classmate whom she hasn’t seen for 25 years. 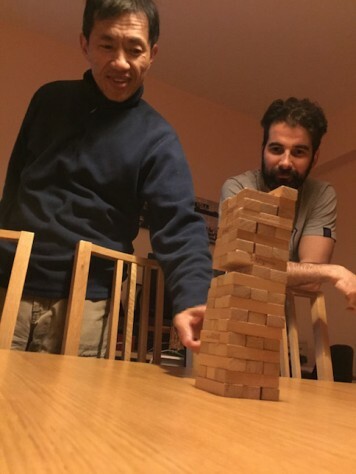 Engin, our couchsurfing host in Istanbul, is an Janga master. He taught us tricks on how to not topple it. “Is that snow?” Joani asked as we approached the the famous Pamukkle “cotton castle” on the second day, which was also the day before Joani’s 14th birthday. “Many magazines took bikini photos here during the summer because it looks just like snow but it is actually made of calcium deposited by the hot spring,” I shared happily my knowledge of the place. “This is your pre-birthday surprise!” Olivia announced to Joani. “We took you here just for your pre-birthday,” I added. Pamukkale Hot Spring in winter. 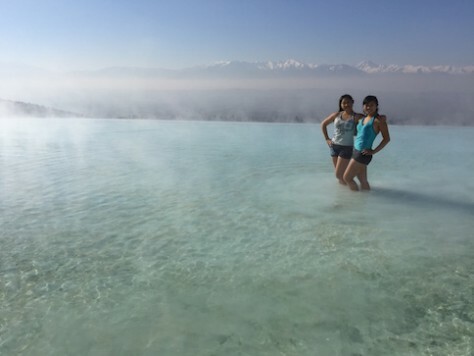 For Joani’s “pre-birthday” celebration, we went and enjoyed the ancient hot spring city of Pamukkale. Indeed, it felt like a dream come true for Joani. 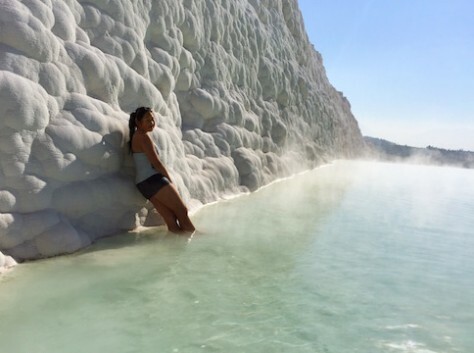 The whole place felt so magical with its white terraces and aqua blue hot spring water flowing over the edge. 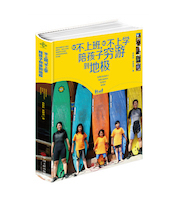 With our swimsuits on, we looked just like those exotic photos of people dipping in hot spring with snow all around us. 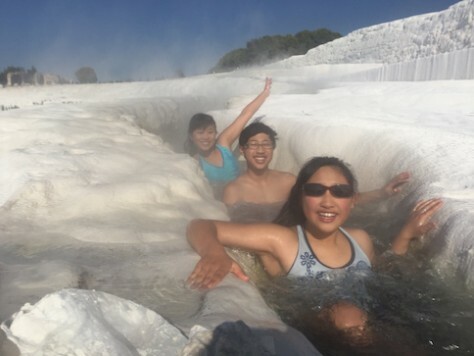 Outdoor Spa in the Snow at Pamukkale, Turkey from Jonathan Su on Vimeo. But Joani’s real birthday celebration on the 28th didn’t begin until the next day when she woke up to my playing “happy birthday” on the ukulele next to the hanging birthday banner that was being re-used for the 4th time while Olivia threw paper snow flakes onto Joani’s head. Also, Nathan served Joani breakfast at the hotel buffet. 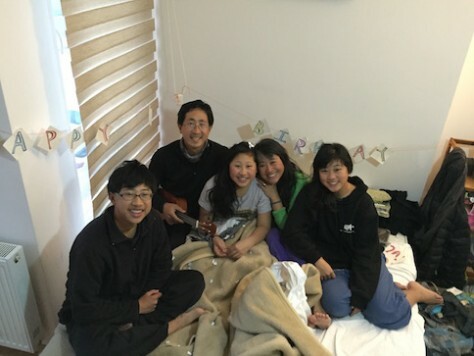 For Joani’s birthday, she got an early birthday wake up call from all of us, singing Happy Birthday. 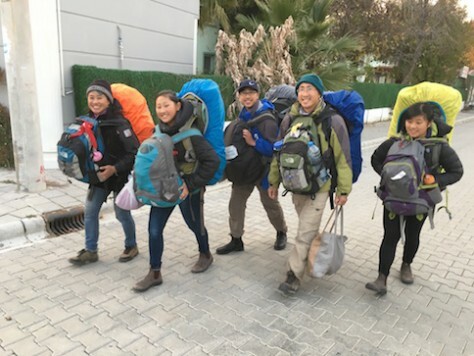 To my own surprise as well, on the bus that morning from Denizli to Fethiye, the famous Mediterranean beach town at the start of the 500 kilometer Lycian Trail, we passed through mountains covered in snow, even thicker than those in Istanbul! 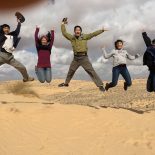 We all got off the bus during one of the bus break, and took photos and played snow fight. Afterwards, Olivia, Annie, I, George, and Nathan took turn answering questions about Joani and playing our favorite games with her. 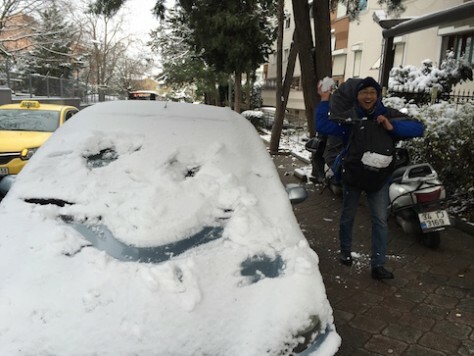 Joani’s dream came true – snow on her birthday! “What is a change you have made because of Joani?” was the question that I picked without looking from the bag prepared by Olivia. “I wish the question asked for ‘few’ changes and not just ‘a’ change,” Joani said, wanting to hear more from me. 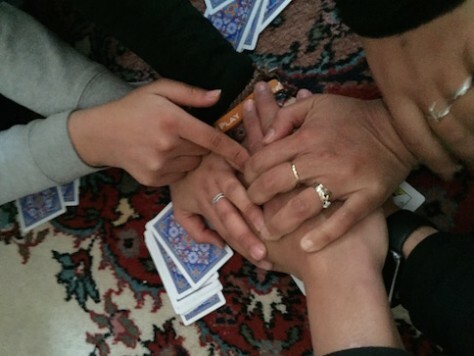 As each of us took turn sharing and playing a game with her, she had such an overdose of non-stop activity that she actually became car sick and had to take a break as well. 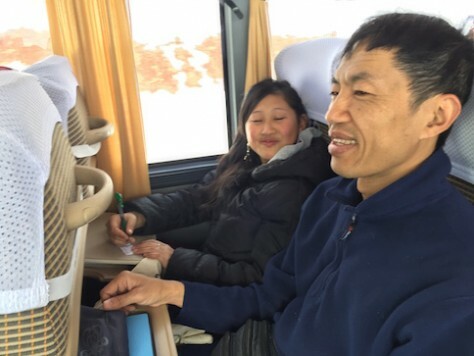 On the bus, George took turn with us to play games and answer questions with Joani, until she got carsick. I did not expect to hear that reaction. I expected her to pick out the chips, snacks, and food she likes without thinking because I was paying for them. I was touched that she was considering my feeling and our tight budget while choosing her birthday dinner. It was an enlightening experience for me to observe how Joani became so responsible when I passed the responsibility of decision to her. 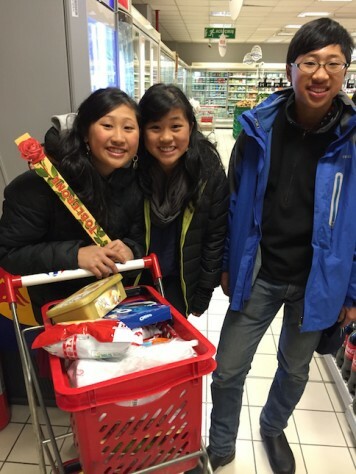 For birthday dinner, Joani got to pick what she wanted to eat and snack from the supermarket. 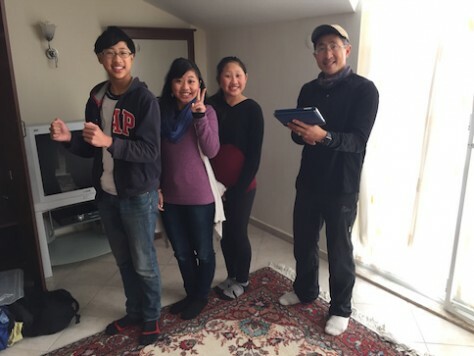 After settling down in a nice two floor AirBnB apartment, we played more of Joani’s favorite game, such as Mao Mao. 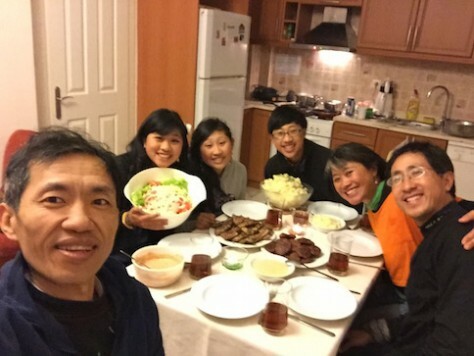 That evening we had a feast of lamb chops, Turkish meat patties with lettuce, mash potatoes with mushroom cream sauce gravy, salad, and ice cream over cake. We played “Mao Mao” for Joani’s birthday. It was a non-stop slapping fun time. Joani got to eat her favorite steak, mash potatoes, and salad for her birthday meal. 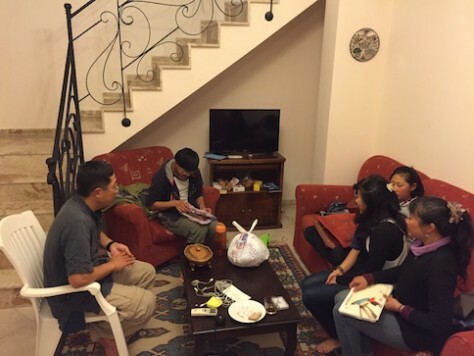 Over the dinner table, we shared how Joani has changed and what we see Joani would become. “For me, it is very delightful to see you become more defined as what God has created you to be. I can just picture you one day as a strong leader in whatever school or community you go to. You are not they type that see things fall apart and live with it. 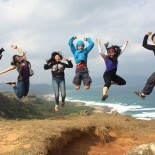 You work with people and try to get people to do things,” Annie shared. It was both fun and meaningful as we shared and blessed Joani on her birthday. It was both fun and meaningful as we gave gifts, shared and blessed Joani on her birthday. 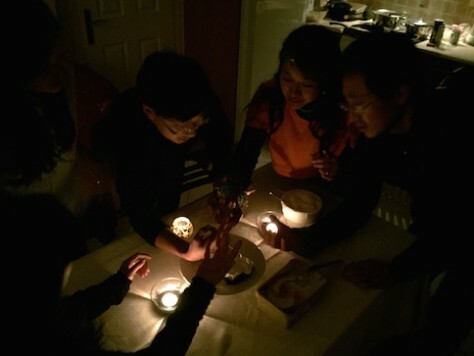 After our sharing time and giving of birthday presents, we prayed and blessed Joani and finished the day with the last surprise: finishing the “14th” episode of the captivating Korean drama, 仁显王后的男人 (The Man Behind Queen Renxian) for her “14th” birthday. 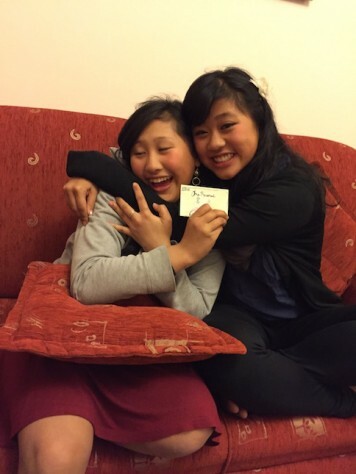 Hugging Joani, our birthday princesses on her 14th birthday. We bought whipping cream and ice-cream to put onto of Joani’s birthday cake. Nathan’s birthday on the 31st of January was to be celebrated while we were in Fethiye. 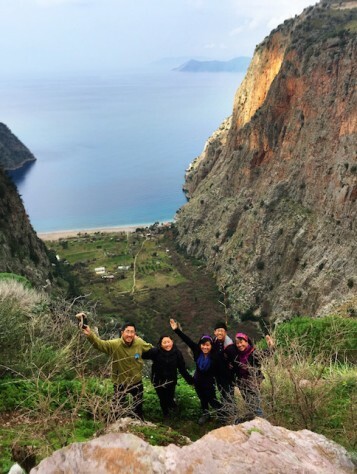 The day before, we took a minibus to the enchanting butterfly valley 20 kilometers south of Fethiye. The valley was surrounded by sheer cliffs 300 meters high on three sides and a lovely beach with clear blue water on the other side. To get down, we had to hold on to ropes to rock climb downward. 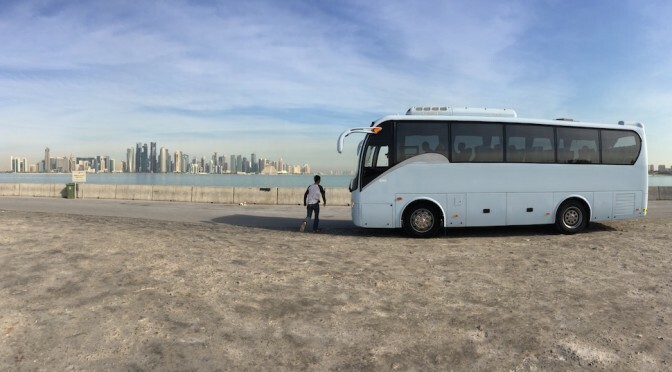 The combination of adventure and panoramic view made it an unforgettable day. The butterfly valley nestled between sheer cliffs on three sides was breath taking as we rock climbed down. 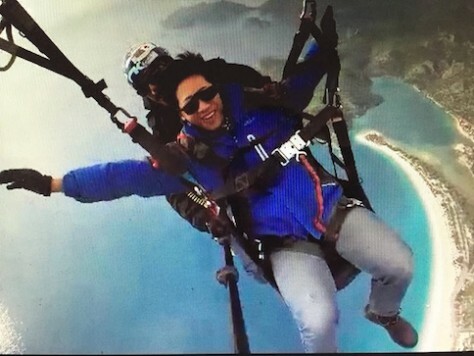 But that day was no comparison to the surprise we had for Nathan’s birthday — paragliding down the 1960 meter cliff into the Blue Lagoon, the same location of the 2012 James Bond film, Skyfall. I purposely timed this activity to be on his 16th birthday. For Nathan’s birthday breakfast, we had grilled cheese sandwiches. 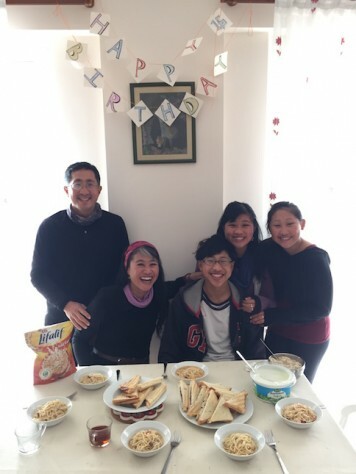 The day started with cooking his favorite grilled sandwich for breakfast and then playing the “Driving Test” Jeopardy game where Nathan, Olivia, and Joani had to answered real driving test questions from the US. It was fun seeing them figuring these for the first time. Even though they have ridden in cars all their life, they had never really thought about how to drive in a way that reduce risk and increase safety. Since Nathan turned 16, we played “driving” Jeopardy using real driving test questions. Nathan won the “driving” Jeopardy game and got his driving license. The paragliding was the highlight, however. We all paraglided with him, but being the birthday boy, we paid for him to have video and photos taken of him while in the air. The cost of this was the same cost as the paragliding so only he got to have it. It took a long time for the cloud and wind direction to be just right on the mountain top. But the wait was worth it as Nathan and all of us lifted up into the clouds and when we broke through the clouds, we were rewarded with aqua blue water and white beach front below us. Nathan’s instructor even let him control the direction of the paraglide and took him on a360 spin with some serious G forces. 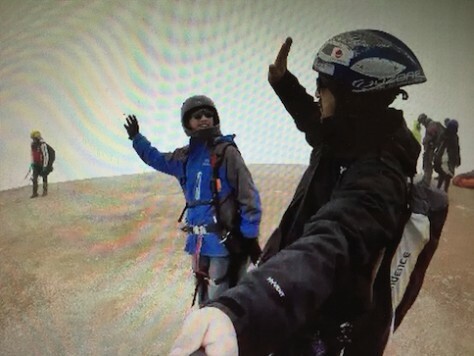 A high five before Nathan jumped off for paragliding. For Nathan’s 16th birthday celebration, he paraglided down the blue lagoon, like James Bond. 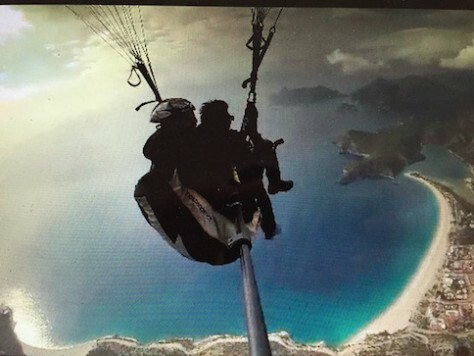 Birthday Paragliding at Fethiye, Turkey from Jonathan Su on Vimeo. But there was another surprised which Nathan later shared was also his highlight – photo scavenger hunt. Joani and Olivia worked hard to come up with creative questions and we broke into two groups of three to compete who had the most creative photos. 8. Most perfect human pyramid. 9. Use three people to make the number 16. 12. Fit as many people as you can on a swing. 13. 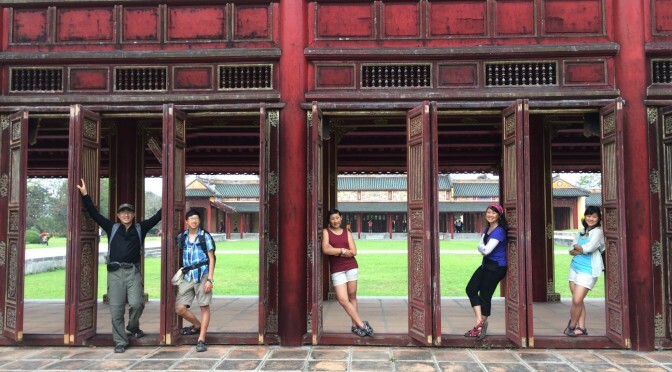 Find the perfect public latrine place. 14. Video of best happy birthday song. 16. Best secret photo of the other team. At the end, it was a tie and we all had lots of laugh throughout the whole process. 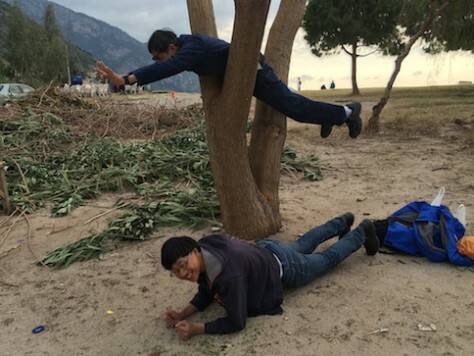 For the birthday photo scavenger hunt, George & Nathan posed for the most creative planking. 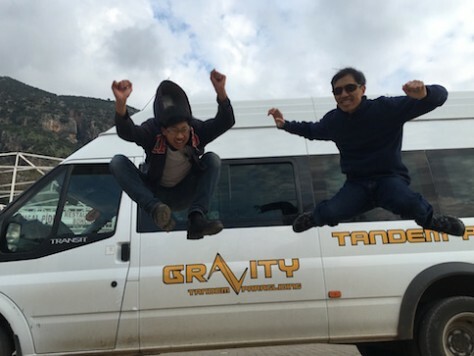 For the birthday photo scavenger hunt, George & Nathan posed for the most creative jumping photo. 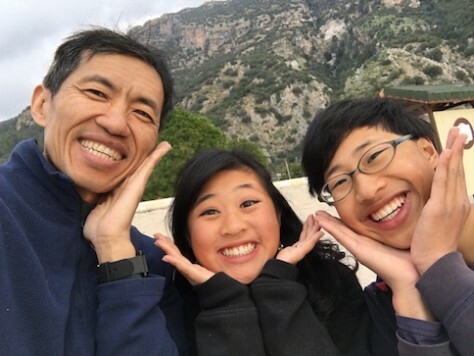 For the birthday photo scavenger hunt, George, Olivia & Nathan posed as cute “Asians” for the letter “A”. 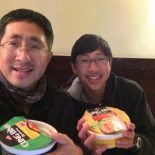 For birthday dinner, Nathan chose his favorite Ranch dressing for salad, asked for fried rice with meatball, and picked out 6 “guilty pleasures”: milk, Pringles chip, ice cream soda, ice cream, Turkish beer, and Doritos. And I pan-fried thick, juicy beef steaks to go with all these goodies. Similarly, we shared our favorite memories with Nathan and what changes we saw in him. “…That means there is a problem when the parent is not…” Nathan quipped, trying to imply about me. “Or our teen is very advanced,” Annie interjected. 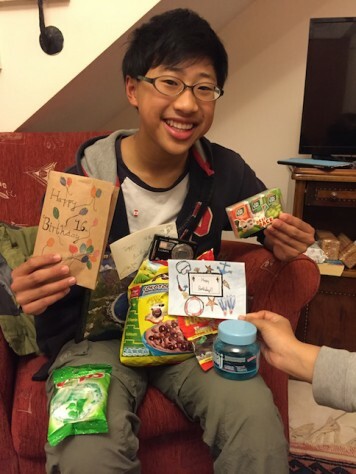 After Nathan’s 16th birthday dinner, we shared and gave gifts to Nathan. “I remember when I broke a glass at Engin’s place. The moment the glass crashed, Nathan was there right away asking, ‘Mommy, are you okay?’ It’s almost like this whole trip, I always know that if I am in trouble, Nathan will come back,” Annie shared as well. After everyone shared, Olivia and Joani dig up old photos of the siblings and narrated a touching slideshow for Nathan. Then we ended the day with giving presents and watching Nathan’s favorite documentaries. Coming to Turkey, we were expecting great food, historical sites, and scenic beaches. Little did we expect to see how Olivia, Nathan, and Joani took the time and effort to give their siblings the most exotic, fun, delicious, and meaningful birthdays. Off we go to another destination.